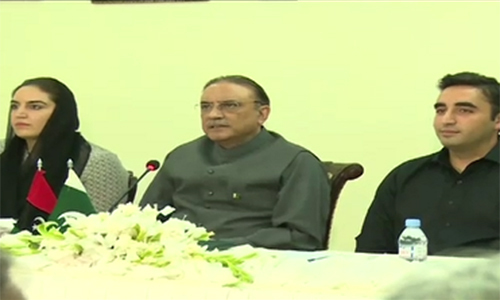 KARACHI (92 News) – The Pakistan People’s Party (PPP) Majlis-e-Amla has endorsed the anti-Army statement issued by PPP co-chairman Asif Zardari during a meeting on Wednesday. Meanwhile, the PPP has decided to bring party chairman Bilawal Bhutto Zardari in the parliament as he is eligible to contest the election. He might contest the election from Lyari, Larkana and Nawab Shah. Sources said that Bilawal Bhutto Zardari would be given the slot of opposition leader in the National Assembly, while Khurshid Shah would be parliamnetary leader and deputy opposition leader. The meeting advised former president Asif Zardari to be steadfast. The meeting also authorized Asif Zardari to hold talks with the government. Briefing the media after the meeting, Farhatullah Babar said that the National Action Plan is not being fully implemented in letter and spirit. “All state institutions should work within their constitutional limits,” he maintained. Ahmed Mukhtar said that Bhutto, Benazir and other party leaders have also issued such statements.